Of course, in 2013, I made it SheppyBrew's mission to have brewed at least one all-grain batch in each of the 23 beer categories (see SheppyBrew Styles). Next up was Category 11 — English Brown Ale. Before this one, I did NSFW Belgium Golden Strong Ale, which was a whopping 9.5% ABV. I thought for Category 11, I would go low ABV with an English Mild (11A). The ABV range for Mild's is 2.8% - 4.5%, and Sloth Man targets close to the middle at 3.7%. It should be medium bodied with lots of caramel, toffee, biscuit malt flavors. The low alcohol lends itself to be consumed in quantity. The name "Sloth Man" is in honor of the Crazy Sloth Man who often lives at the top of the biggest tree in the Brewery's back yard. He blends in so well, that the Beer Model and Brewing Assistants have never actually seen him even though the Brewing Assistants climb the tree often in search of the Crazy Sloth Man. However, he does come out of the tree when the Brew Master has had a few too many beers to safely operate the gas grill and takes over cooking meats. From time to time, he will also sip (or gulp) some of the Brew Master's beers to help reduce the chances that the Brew Master will be hung over on Monday morning. The Crazy Sloth Man heads South for the fall and winter so that no one will see him while the tree is bare. The beer itself contains the "Gluten Killer" Clarity-Ferm, so that I can use it as payment to "Gretchen" who will be taking care of the Brewing Assistants during GABF again this year. Liked the flavor of Gnasty ESB, so decided to replicate its water additions. Basically, got Denver Water profile to Burton on Trent and then reducing quite a bit. A day or two before brew day, make a liter starter with harvested WLP007. Mash and boil as directed. Cool wort as close to 60 degrees as possible. Don't forget to add clarity-ferm. Pitch yeast. 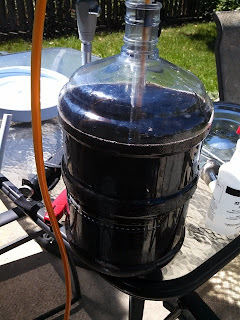 Keep cool until fermentation starts, then let temperature rise to ambient. Ferment one to two weeks. Bottle or keg, targeting 2.3 volumes carbonation. Brewed yesterday. Everything went great ... except I still have no signs of fermentation. I think I over chilled. Today, I added some more yeast and shook / stirred for more aeration. Hopefully this will get going by tomorrow morning. The beer took off after re-pitching. Temp has been perfect, in the mid-60's. Racked into 2ndary to make room for X-Mas ale. Gravity at 1.015, which makes this about 3% abv. Sample smooth and well balanced. Took another sample. May be at 1.014 now.Still has a nice smooth balanced flavor. It looks like this will be my lowest abv beer by far. Bottled a little more than half and left the rest in the keg. Only 3.75oz of sugar, so carbonation should be pretty low. Got 13 12oz; 4 bombers; and 2 1 liter bottles. The PET bottles seem pretty firm, so maybe I was wrong about low carbonation. Had a bottle last night. Carbonation is fine. Might be a bit high for style, but ok. Great low alcohol beer. Also tried some from keg today. Nice and chocolatey. Maybe a little bit under carbonated but fine for the style probably. Very nice to watch football with such a nice session beer. Had a liter PET. REALLY carbonated and sweet. Poured most of it out. Seems like a bunch of sugar must have ended up in this bottle. The keg is now gone. Still have a few bottles left. Too bad. This was a nice beer to have on tap. Had a bomber. Overcarbonated, so had to pour slowly. Really good still. Last liter. Still tasting pretty good.